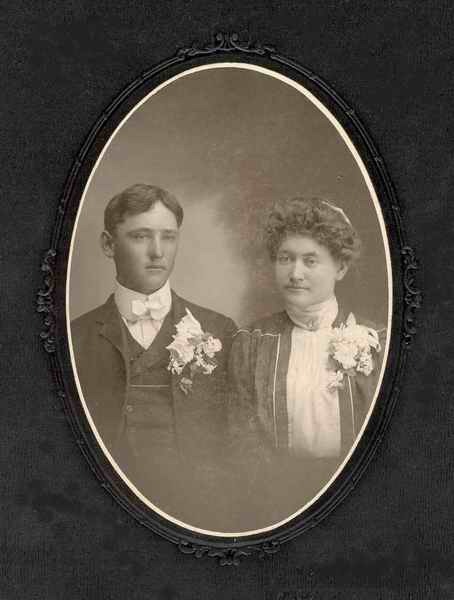 Mrs. Emma Kaiser, daughter of Fred and Anna Woerlen, was born January 21, 1879 in Nemaha county near Johnson, Nebraska. When she was yet an infant she became a member of the Christian church by the rite of Holy Baptism. She received her religious training at home and in the church school of her community, and was confirmed in the Lutheran Faith on March 26, 1893. She grew up to young womanhood at her birthplace. On November 30, 1904, she was united in marriage with Christian Kaiser. Shortly thereafter, she moved with her husband to Phillips County. They made their home on a farm located northwest of Phillipsburg. Here Mrs. Kaiser lived until her last illness. To this union were born 6 children, 3 boys and 3 girls, all of whom are still living. Mrs. Kaisers health for some time had not been very well. Six weeks ago she was taken to the Brewster hospital in Holdrege for treatment, but never recovered. She passed away Sunday, May 25, at the age of 74 years, four months and 3 days. Funeral services were held on May 27 at Emmanuel Lutheran church, Stuttgart. Pastor Herbert J. Schauer officiated at the service. Pallbearers were Henry Kaiser, Erwin Kaiser, Harold Kaiser, Gus Kaiser, Ludwig Kaiser and Ellsworth Kaiser. Interment was made in the Emmanuel Lutheran church cemetery at Stuttgart. Brother - John Fred Woerlen Jr.